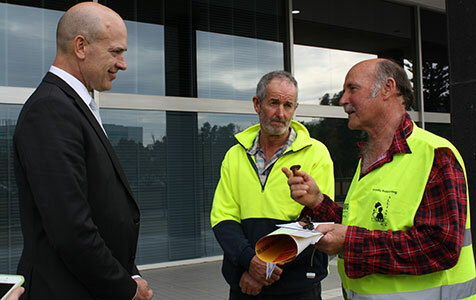 Transport minister Dean Nalder with WAFarmers president Dale Park and Wheatbelt Railway Retention Alliance chairman Greg Richards. A convoy of truck drivers headed by WAFarmers and the Wheatbelt Railway Retention Alliance drove through parts of Perth today to demonstrate their opposition to the closure of the Tier 3 rail lines. Good on the Railway Alliance for taking a stand. The whole rail system needs to be looked at with a view to the future for existing and potential industry and transport requirements. There are too many trucks on the road now. Bunbury is facing its own issues with additional trucks being placed onto the road to cart grain and now (following Lanco EPA approval) possibly coal to the Bunbury Port.